An enchilada is a classic Mexican dish used as a hearty dinner or lunch. Described as a rolled maize tortilla stuffed with meat or vegetables and covered with tomato or chilli sauce, they come in a number of varieties. These enchiladas use tender strips of chicken, beautifully wrapped in soft golden corn tortillas. 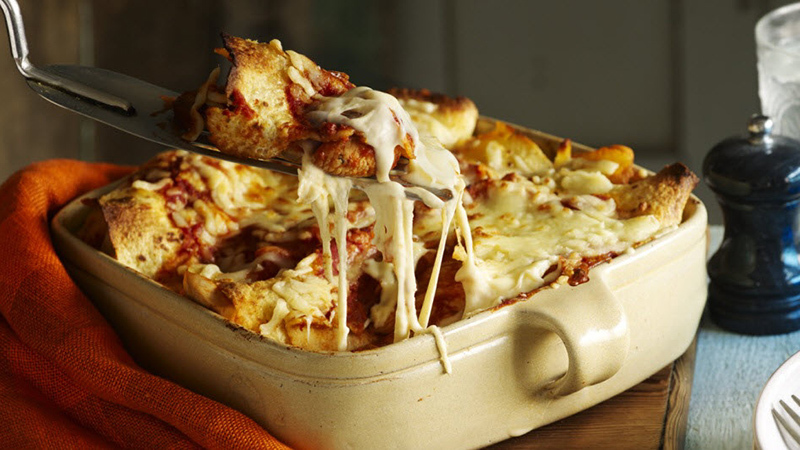 It is topped with a rich, tangy tomato sauce, oozing in melted cheese. A delicious, messy and hearty meal, it is best shared with family & close friends. Slice the tender chicken into thin strips. Get the pan sizzling hot and add a splash of oil. Throw in the tender chicken strips and stir-fry over a medium heat until it’s golden, juicy and cooked right through. In a bowl, stir up the Enchilada Spice Mix with both parts of the Tomato Sauce sachet and 150 ml hot water. Pour half of the mixture over the chicken, add half the grated cheese and stir it up. Pierce the packaging of the Soft Corn Tortillas and microwave on full power for 35-40 seconds or heat in the oven following the pack instructions. Keep them covered until ready to serve. Now, spoon the filling onto the middle of the warm tortillas, wrap them up and lay them folded side down onto a lightly greased baking dish. Pour over the remaining sauce and sprinkle on the rest of the grated cheese. Bake in a pre-heated oven for 10 minutes, until the cheese is golden and bubbling. Take out the piping hot cheesy enchiladas, gather up all your hungry guests and get stuck in together!